Hey there! I was wondering how to tell if an albino cornsnake was shedding or in pre-shed. I noticed that she had some regurgitation movements the last time she ate, although she ended up not regurgitating and took her meal well. The food wasn't large either. I heard that if you feed your snake in pre-shed they can regurgitate. Aside from that I noticed that she hides a lot lately. I added a hide box and I keep it humid, but she stopped hiding there after two days. I haven't been handling her since the last time she ate and it's been 5 days. She has been moving around but from only two spots- her hide box on the cool end and on top of a plastic tree on the hot end. I wonder if I should feed her this week or skip and if there are any other tips for me when it comes to letting her shed. Yeah! Like the mouse she swallowed moved back up her neck before going back down.... and she yawned quite a bit afterwards. Really strange if you ask me, but I'm a new owner so I'm not too sure. Snakes yawn after eating to reset their jaws after spreading them so wide. All snakes do that. I've heard about that, although what put me off was the movement of the mouse since it moved up her neck. I've been feeding her week after week and she's never done anything like that... and the mice I've fed her were the same size. I feel like maybe I'm being overly concerned but I do want to know what are the signs of a shedding albino snake. 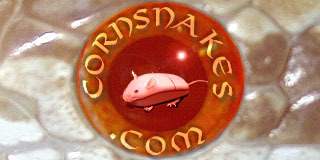 Do their eyes turn dull and blue like other cornsnakes? Thanks so much for answering though! I'm glad it seems that I'm just being overly concerned for no reason. The eyes of an albino do cloud over the same way other morphs do. It may not seem as obvious, but it does happen. You have a beautiful little noodle. Glad you were able to figure her out. I just got my Peach a few months ago and she's over a year old now. I found myself worrying that much about her as well. It's a good sign that you are a good parent. Enjoy your little one.